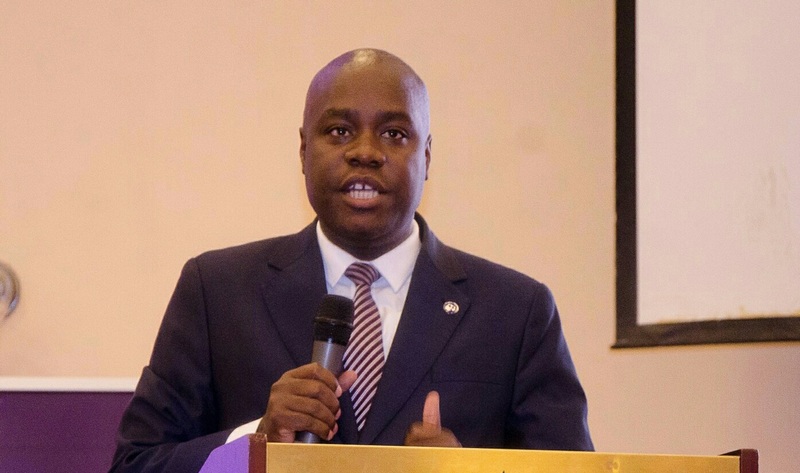 Uganda Law Society (ULS), the umbrella body of legal practitioners in Uganda has condemned the selective application of the Public Order Management Act. 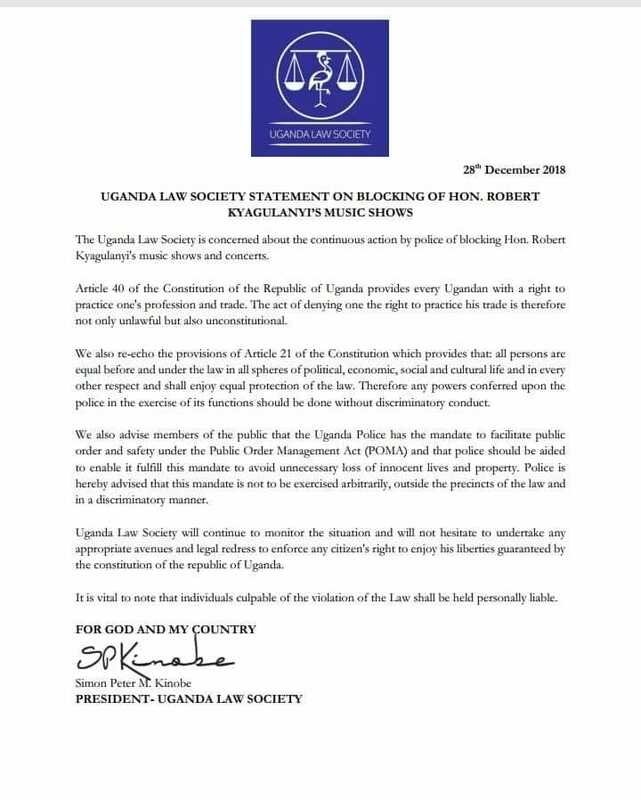 Simon Peter Kinobe, ULS president made the remarks in statement issued on Friday evening in relation to music concerts organized by Kyaddondo East Member of Parliament Robert Kyagulanyi, Bobi Wine where he advised police not to exercise its mandate arbitrarily and outside the precincts of the law. 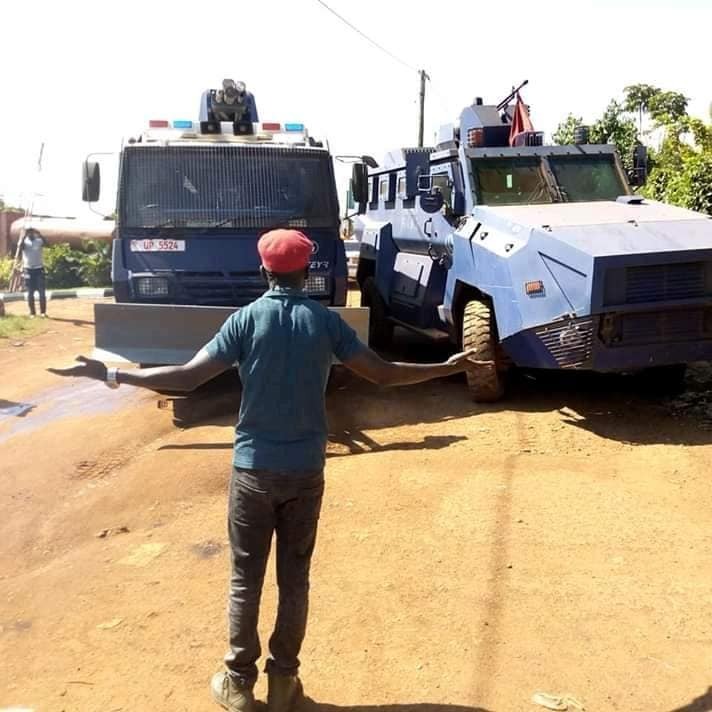 This come after police blocked a planned concert at One Love Beach Busabala, on grounds that Bobi Wine had not obtained security clearance for the concert. The development comes barely two months after Bobi Wine was stopped from launching his Kyarenga album from the Mandela National Stadium, Namboole, allegedly because the stadium had been booked for other activities. After three failed attempts in Namboole, the launch was successfully held in Busabala. ULS contends that blocking Bobi Wine’s performances contravenes Article 40 of the Constitution of the Republic of Uganda provides every Ugandan with a right to practice one’s profession and trade. The society adds that the police action is not only unlawful but also unconstitutional. While Bobi Wine’s show was stopped, all other concerts went on as planned across the country. Notable among them was the annual Tondeka e Kiwatule concert organized by Bobi Wine’s nemesis Moses Ssali also known as Bebe Cool. Statement by Uganda Law Society condemning selective applications of public management bill. According to the law Society, all persons should be treated as equal before the law and in all spheres of political, economic, social and cultural life as provided for under article 21 of the constitution. “Therefore, any powers conferred upon the police in the exercise of its functions should be done without discriminatory conduct,” the Law Society says. The society however advised that the Uganda Police has the mandate to facilitate public order and safety under the Public Order Management Act (POMA) and that police should be aided to enable it to fulfill this mandate to avoid unnecessary loss of innocent lives and property. ULS has also cautioned that individuals culpable of the violation of the Law shall be held personally liable. “Uganda Law Society will continue to monitor the situation and will not hesitate to undertake any appropriate avenues and legal redress to enforce any citizen’s right to enjoy his liberties guaranteed by the constitution of the republic of Uganda,” ULS adds in a statement.